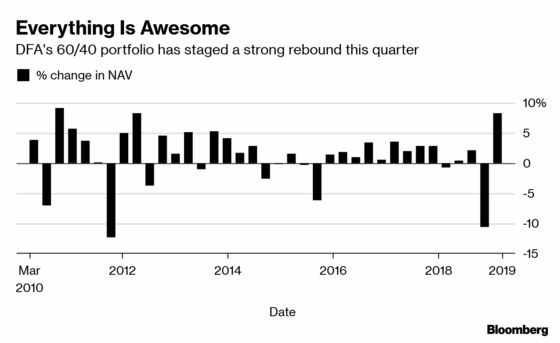 (Bloomberg) -- For the vanilla fund manager, stocks rallying in concert with bonds has proved a godsend at a vexed stage of the business cycle. The question is the whether the equity recovery fueled by the Federal Reserve’s dovish capitulation is on borrowed time as growth fears bite. For now, the classic investing strategy that allocates 60 percent to equities and 40 percent to fixed income looks poised for one of its best quarters since the crisis, according to a popular benchmark. Anchored by ultra-low volatility, the bond-stock rally is also boosting risk-parity funds, which weight multi-asset portfolios by price swings. An S&P index tracking the quant style is at a record high, on track for its best quarter since 2010. It may all be too good to be true. The Fed’s strikingly dovish stance this week, cutting projections for rate hikes while announcing an end-point for quantitative tightening, flashes a bearish message on growth and corporate earnings -- one foretold in Treasuries all year. The mixed signals were underscored by the underwhelming equity reaction to the Fed decision in Wednesday trading. It all helps to explain why money managers are racked with existential doubts, belying the almost $10 trillion stock rally around the world this year. 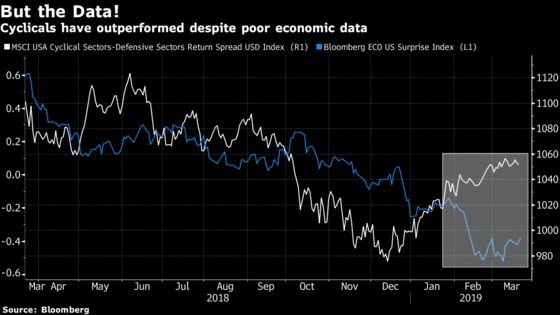 “The Fed has made such a big sea-change in terms of their view, it probably raises more questions as to why are they more worried than they were a few months ago?” said David Holohan, a strategist at Mediolanum Asset Management in Dublin, which is underweight equities and overweight bonds. “The fact that the business cycle and the macroeconomic cycle are where they are suggest a more limited impact” for monetary policy in juicing risk assets, he said. “Either we’re going to get slower growth or we’re not going to get Fed rate cuts,” said Thomas Thygesen, SEB AB’s cross-asset head strategist. Heeding the mixed signals, James Bateman has shifted to defensive mode. 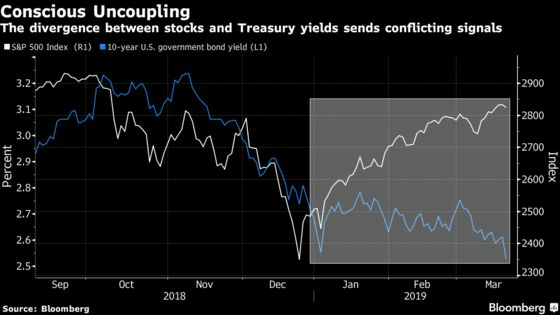 After advancing in tandem, there’s a risk bonds and stocks could fall together, according to the chief investment officer on the multi-assets team at Fidelity International. Since upgrading both assets to overweight in January, Bateman’s funds are trimming equity holdings and turning neutral on fixed income in favor of alternatives. “The reality is -- dovish messaging aside -- that the data over the coming months is likely to support further tightening either late in 2019 or early next year,” he said. Over at HSBC Global Asset Management, which oversees over $450 billion, Joe Little reckons something’s got to give -- but he sees a muddle-through scenario. Higher yields are in the cards but they’re unlikely to kill off the equity rally, according to the global chief strategist. “You get OK growth -- just slightly below-trend growth this year, plus dovish policy, that’s not too bad an environment for the corporate sector,” he said. The fund is underweight government debt and bullish on equities. Right now, stable inflation is boosting equity and bond valuations in tandem. And big trends from demographics, technology, the Fed’s balance sheet to the rise of price-insensitive buyers are all capping longer-dated yields -- suggesting growth fears in government debt shouldn’t be overstated. But the disconnect looks jarring, according to Thygesen at SEB. It’s hard to imagine further upside for equities without a steeper yield curve, he said. That’s not to say there’s dumb euphoria in equity markets. Positioning is muted while defensive strategies like low-volatility stocks are in vogue. A valuation catch-up from the 2018 meltdown suggests investors aren’t mindlessly ratcheting up projections on earnings, while companies that benefit from low yields like dividend payers and real-estate units rebound. And of course, rich stock-bond prices have precedents in the current cycle and yesteryear. Jim Paulsen, chief investment strategist at Leuthold Group, dubs it a relief rally of sorts after a possible Fed policy mistake, consistent with the “aftermath of a mid-cycle overheat within an ongoing expansion,” he wrote in a note this month. But with futures pricing in the prospect of a U.S. rate cut next year, it’s unclear how long this Goldilocks-lite sweet spot can last. On the flip side, a Treasury sell-off on the heels of better data could inflict a double blow for funds that have gorged on debt and equities -- lulled by the subdued discount rate. “Somebody is going to have to be disappointed,” said Thygesen.